This is a Cajun Jambalya, with just the barest of a nod to the Creole tradition. I like Creole Jambalaya (with tomatoes and seafood), but Cajun is my favorite. I made this today for my mother-in-law’s birthday party. It’s my most requested dish for family gatherings; it came out very well today. 1 pound shrimp, peeled and cleaned, with their tails left on. — Salt and cayenne to taste. Depending on the heat of the andouille/chorizo, whether or not you use tasso, and the saltiness of your sausage, you’ll need to use more or less salt and cayenne. Heat a heavy Dutch oven on high and add the ham. After the ham browns, add the sausage and brown in batches. As the sausage browns, remove with a slotted spoon and add another batch. You shouldn’t need to use any additional oil, as the sausage should render plenty as it browns. Be careful not to burn the sausage — if you do burn the meat, the jambalaya will end up bitter. When the ham and sausage have finished browning, brown the chicken. Don’t overcook the chicken, or it will shred. Remove chicken. Lower the heat and add the onion. Saute until onions while scraping up the brown bits from the meat. Saute until the onions are soft and brown and just beginning to carmelize. Add the celery and bell pepper and saute 4 or 5 minutes. Add the garlic and saute for just one minute (Garlic burns very easily, you just want to sweat it). Add 1 cup of the stock and scrape all the tasty little brown bits from the pot. Add the thyme, bay leaves, basil, pepper and meat and simmer. Continue scraping the brown bits up — that’s where the color and flavor live! Continue simmering until stock is gone. This is where I do most of my tasting. The flavors should be pretty gigantic at this point, remember, we still have to add the rice! Add the rest of the stock and bring to a boil. Add the rice, reduce the heat to medium, and gently turn the rice. After a couple of minutes, add the parsley. Turn the rice once or twice to ensure that no rice sticks to the pot. When the pot begins to boil, reduce heat to low, toss in the shrimpies and simmer, covered, for at least 25 minutes. Do not remove the cover while the rice is steaming. DO NOT remove the cover. AND DO NOT STIR. Don’t do it! I’m telling you, don’t lift that lid and don’t stir that pot. Get your hand out of there! Did you stir that rice? You did, didn’t you! 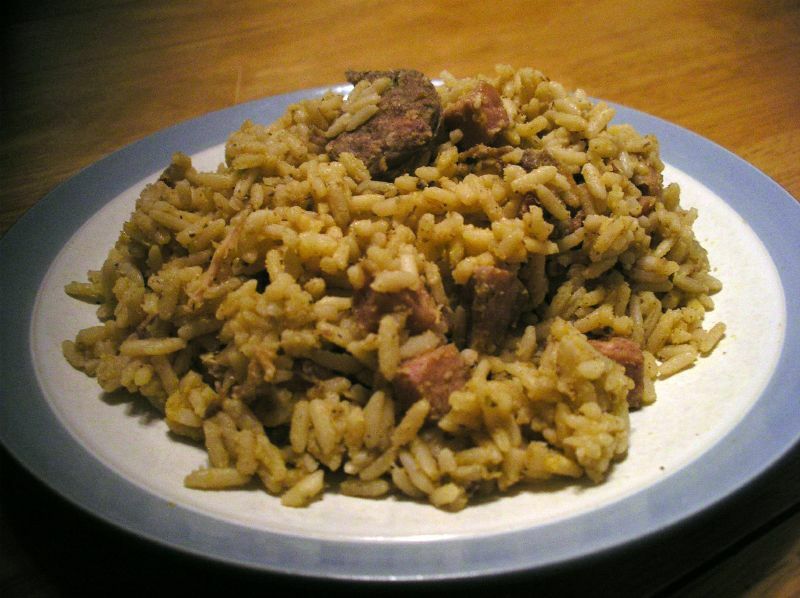 When the jambalaya is done, remove from heat, turn the rice and meat to mix everything up again and serve!